Chronic rhinitis refers to the inflammation of the mucous membranes of the nasal passages. It may be caused by a virus, hormonal changes or due to some non- prescribed medicines. People who suffer from chronic rhinitis experience irritating signs and symptoms. There is running nose for about ten days. It is best to get your blood test done to find out the allergen behind chronic rhinitis. There are number of conventional remedies that are prescribed for chronic rhinitis. These remedies only help to give relief from symptoms but there is no permanent solution to the problem. Some doctors prescribe nasal steroid drops that relieve congestion and inflammation of the nose. If anyone finds that allergen is the real cause of allergic reaction then one should avoid coming in contact with that particular allergen. 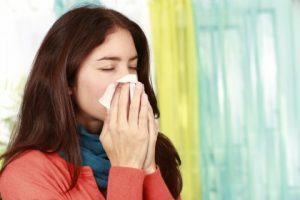 Patient suffering from allergic rhinitis should avoid coming in contact with household dust, pet dander, dust mites and other such common allergens present in the house. Pollen allergy is another common cause for allergic rhinitis. Anyone who is allergic to pollens should avoid exposure to pollens by keeping the windows closed. There are many natural remedies for chronic rhinitis which help to give quick relief from recurrent attacks of allergic reaction by boosting up the immune system. Natural remedies for chronic rhinitis prevent recurrent signs and symptoms and give long lasting results to the patient. There are many chronic rhinitis home remedies as well which also help to get relief from allergic symptoms by taking these useful home remedies. Chronic rhinitis home remedies are discussed in this article later. Whenever there is low humidity in the atmosphere the attack of chronic rhinitis may get triggered. There occurs congestion in the nose due to decreased mucus extracted out from the nose. Some time chronic rhinitis may be present due to congenital abnormalities such as deviated septum or enlarge adenoids. In such cases surgery is recommended to get relief from symptoms. There is a risk of developing nasal polyps, ear infections and headache. Headache is a common symptom with chronic rhinitis due to congestion of the head. Running nose and congestion in the nose are the most common symptoms of chronic rhinitis. There is frequent sneezing and watering from the eyes. Redness of eyes occurs with itching and burning sensation in the eyes. There is itching and sometimes pain in the throat and eyes. There is lethargy and tiredness. Feverish feeling may occur and patient may feel cold. Patient wants to lie down with closed eyes. 1 pack = Divya Swasari Ras 20 gm, Divya Sitopladi Churna 25 gm, Divya Abhrak Bhasm 5 gm., Divya Pravala Pisti 5 gm. , Divya Trikatu Churna 25 gm. , Divya Lakshmi Vilas Ras 40 gm, Divya Sanjivani Vati 20 gm. Divya Swasari Ras: This is one of the best herbal remedy for the treatment of allergic rhinitis. It helps to boost up the immune system and gives quick relief from all signs and symptoms of chronic rhinitis. Divya Sitopladi Churna: This is a natural remedy for the treatment of respiratory problems. It is an excellent natural remedy for the treatment of chronic rhinitis. It helps to relieve congestion of the nose and eliminate mucus from the nose easily. Divya Abhrak Bhasm: This natural remedy is generally used for boosting up the immunity and to prevent recurrent attacks of rhinitis. It provides nutrition to the nasal passages and prevents allergic reaction produced in the body due to low immunity. Divya Praval Pishti: This natural remedy is absolutely safe for the treatment of respiratory congestion. There is no fear of side effects as it is a natural remedy and absolutely safe for the treatment of respiratory allergies even if taken regularly for a longer time period. Divya Trikatu Churna: This herbal remedy is a combination of three useful natural remedies for chronic rhinitis. 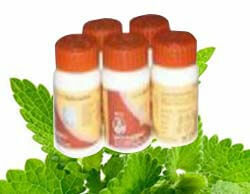 The three herbs found in this product are absolutely natural and do not produce any side effects. This remedy may be taken regularly for a longer time period to get excellent results. Divya Lakshmi Vilas Ras: This is the best known herbal remedy for the treatment of allergic rhinitis. It immediately helps to give relief from sneezing and irritation in the throat. It is a wonderful herbal remedy for the treatment of nasal congestion. Divya Sanjivani Vati: This is an herb which is found to be one of the best herbs for the treatment of respiratory diseases. This helps to boost up the immunity and prevent recurrent attacks of respiratory allergy. Take grapefruit and lemon and boil it. Add a tea spoon of honey to the mixture. Take one teaspoon of this mixture everyday to get relief from symptoms of chronic rhinitis. Drink plenty of water to liquefy the mucus and elimination from the body. It gives quick relief from nasal congestion. Keep yourself away from mental and physical stress because stress is one of the major causes of attacks of chronic rhinitis. Do not take part in cleaning of the house, as it may trigger the allergic attack. Always wash the drapers regularly and cover your nose with a thin cloth to avoid contact with dust and mites. Keep your animals outside the house or in separate apartment because animal dander in the house may be one of the common reasons for getting an attack of allergies. Grape seed extract is a wonderful home remedy for the treatment of chronic rhinitis. It is natural anti-histamine and prevents attacks of allergies rhinitis when taken regularly. Adequate rest is required by the patient suffering from allergic rhinitis. Sufficient humidity should be present in the atmosphere to prevent attacks of rhinitis because dry air may produce symptoms of allergic rhinitis. Ginger tea is also an effective home remedy for the treatment of allergic rhinitis. Ginger is a natural anti-inflammatory remedy and helps to reduce inflammation of the nose.